For those of you don’ t know Mr. Putin and his government have declared all out war on the LGBT community. Mr. Putin signed a law allowing police officers to arrest tourists and foreign nationals they suspect of being homosexual, lesbian or “pro-gay” and detain them for up to 14 days. Harvey Fierstein in his New York Times Op Ed piece writes eloquently about the anti-gay horror that is happening in Russia. I urge you to read it. Each day news out of Russia gets more horrifying: Neo Nazis Skinheads are publicly torturing and bullying LGBT teenagers then posting videos with the local Government’s consent. Read and watch it here if you have the stomach for it. Mr Putin is allowing Neo Nazis Skinheads to torture LGBT youth legally in Russia today. Everyone should be outraged and remember – this is about perception if they perceive you to be gay then you are fair game. 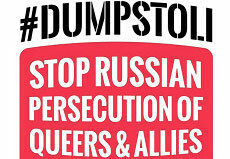 It’s rare I make such an overt political plea here on my blog, but as a gay man I would be negligent not to ask everyone reading this to Boycott everything Russian including any travel to that country until considerable change has occurred. Certainly Stoli Vodka, a popular Russian Vodka, is being taken off the shelves of every gay bar in the Country – it’s a small step, but we have to start somewhere. Next time you buy vodka I would recommend a wonderful domestic, organic one called, Crop Vodka. This entry was posted in Politics and tagged Boycott Russia, Boycott Stoli Vodka, Harvey Fierstein, LGBT torture, neo nazis, NYT, OP ED, Russia. Bookmark the permalink.